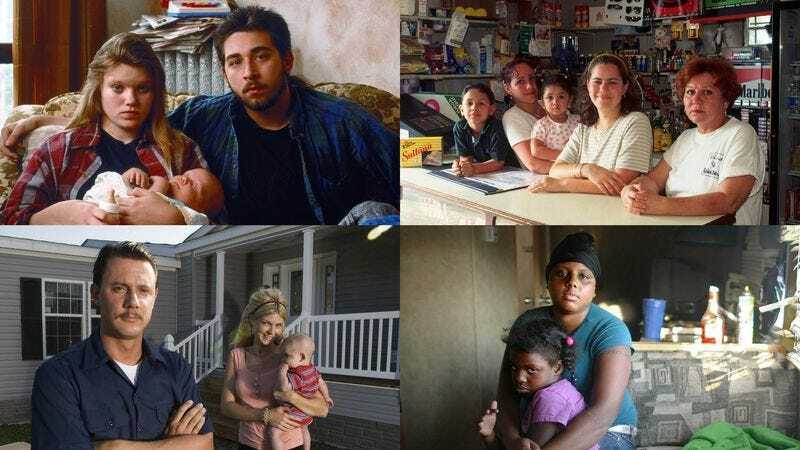 Despite their many struggles, the nation's lower-class individuals say they cannot imagine being as deluded and disappointed as the nation's middle class. CHAPEL HILL, NC—A survey released Wednesday by researchers at the University of North Carolina found that despite the many challenges they face, the nation's lowest-income individuals are nonetheless thankful they don't have to endure the unique hardships of the nation's long-suffering middle class. The survey found nearly 87 percent of the nation's lowest earners take comfort knowing they are far enough down the economic chain that their children and grandchildren won't possibly be able to live in circumstances any worse than their own, while 65 percent noted they have enough bills to worry about without the additional middle-class burden of making student loan payments or contributions toward a retirement plan that will probably go bust in the next market crash, anyway. In addition, half of all destitute Americans said that while they lack medical coverage, at least they aren't stuck paying increasingly high premiums for an increasingly terrible health insurance plan. And nearly all survey participants agreed they are grateful not to be trapped chasing "some sort of fantasy dream life" of middle-class American prosperity that no one in the year 2012 can ever possibly attain. "I can't even fathom what it would be like to drag yourself to work every morning actually believing that someday it will all pay off," said Bronx, NY substitute teacher David McGrath, who along with his wife and 2-year-old son survives on food stamps. "Or to practically kill yourself for a job promotion or meager raise while under the delusion that you can work your way to the top. People waste the best years of their life doing that, and it's a goddamn tragedy." Americans who live paycheck to paycheck and struggle to make ends meet told researchers they feel humbled by the travails of the middle class, and take solace knowing that however bad things seem, "some people out there have it a whole lot worse." "Imagine how traumatic it is to grow up feeling like a failure because you think you have some kind of control over what you achieve in life," said Dana Joerger, a 31-year-old waitress and single mother of three in Stockton, CA. "I just hope and pray my family never falls into the endless cycle of disappointment that plagues our middle class." Researchers also found that people who were once part of the nation's middle class experience a profound sense of relief upon moving down the country's socioeconomic ladder and finding themselves on the bottom rung. "Honestly, I can't tell you how much better I feel these days," said 42-year-old former IT technician Ryan Tunnicliffe, who last April lost his job and, subsequently, his house. "Just knowing I no longer have to strive for something completely and utterly out of reach is such a load off my mind." "I'm poor, and I'm going to stay poor," Tunnicliffe continued while staring at his $320 weekly unemployment check. "It's been very liberating." Reached for comment, several members of the nation's upper class said they are "equally grateful" to have been spared the hardships of the middle class.